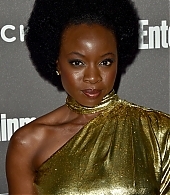 Danai was at the Entertainment Weekly Pre-Sag Party last night in LA! I’ve added some photos from the event to the gallery. Danai is on the cover of the upcoming June 2018 issue of Ebony Magazine, on stands May 24! You can view the full-size photos in the gallery and watch a behind the scenes video on their website here. 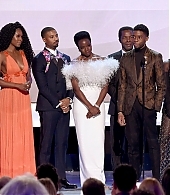 Chances are people recognize her for her resilient roles as Michonne on AMC’s The Walking Dead or as Okoye in Marvel’s Black Panther or Avengers films. 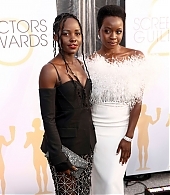 While she shoots up the ladder of success in Hollywood, Gurira is widening the door, and it’s the stories she shares and the opportunities she gives other women, who look like her, that she wants you to remember. 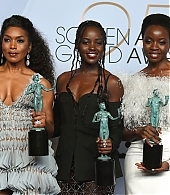 The Iowa-born actress who was raised in Zimbabwe recognizes what it takes to attain success as a Black woman. She understands having to work twice as hard for much less of the pie. In real life, she’s more reserved than the characters she has been fortunate to play. Though she may not have to fight physically for her survival, she navigates an industry where the fight for inclusion is just as exhausting. 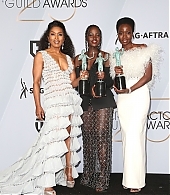 She gracefully does so by providing other actresses with opportunities and using her platform to sponsor African arts students with the chance to study at American universities. Gurira posed for her EBONY photo shoot, radiating the aura of someone who knows where she is in life yet is still on a mission to get where she wants to go. While dancing to Diana Ross’ infectious 1979 single “The Boss,” she was honest about being just like almost every other Black woman: wanting to read more, rarely fitting in time to cook and being a bit too attached to her phone. 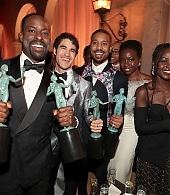 And still, she is continuing her growth as a full-fledged, multihyphenate: actress/writer/producer and wildlife activist. Read the exclusive story in the June 2018 issue of EBONY magazine.